The U.S. Supreme Court today announced it would let stand California’s ban on gay reparative or “conversion” therapy for minors, Bloomberg News reports. The ban, passed by the California State Assembly in 2012, was challenged by professionals who practice sexual orientation change therapy, two families who say their teenage sons benefited from it and a national association of Christian mental health counselors. On August 29, 2013, a three-judge panel of the Ninth Circuit Court of Appeals unanimously upheld the law, ruling that the plaintiffs in two legal challenges could not succeed on their claim that the law infringes the free speech rights of therapists who wish to engage in these dangerous and long-discredited practices. The full Ninth Circuit court declined to further review that decision, and the plaintiffs in the two lawsuits then asked the Supreme Court to review the cases. 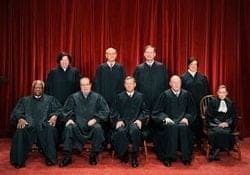 The Supreme Court denied those requests today, meaning that the Ninth Circuit panel’s decision upholding the law will be the final decision on the plaintiffs’ free-speech claims and the California law may be enforced. The California ban was the first of its kind to be passed in the U.S. and can now be put into effect having cleared its final legal hurdle before implementation could begin. New York recently failed to pass a similar ban on reparative therapy for minors. In Texas, the GOP Party platform endorses gay conversion therapy, though the Texas GOP party chairman has come out against the policy.